During a soil productivity lab in AP Environmental Science on Friday, Jan. 25, science teacher Julie Roberts helps senior Liz Fraka compare the phosphorus level of a soil sample. 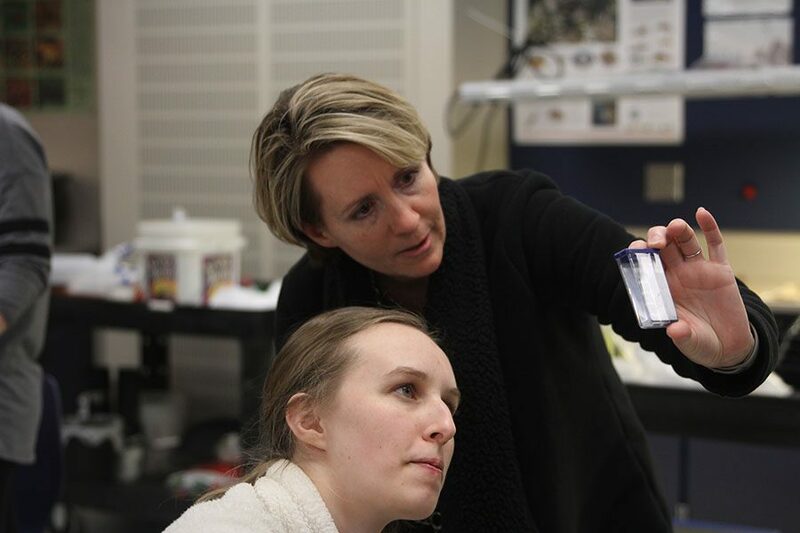 Examining samples using a microscope is typical science class fare, but for science teacher Julie Roberts, it brings back memories of her past as a researcher for Bayer CropScience. While crop scientists study many things, Roberts’ research focused more on the aquatic side of things. 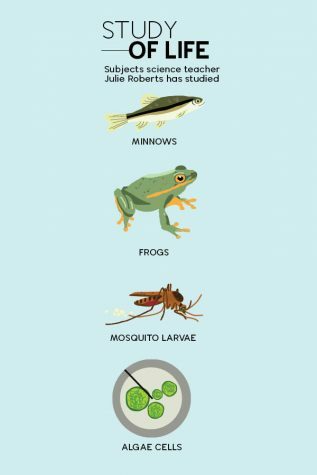 “Bayer CropScience develops products that go on crops, so my research was to ensure that the products that were being created were safe for the aquatic environment, or anything that lived in waterways, or to make sure that the product was not dangerous to them.” Roberts said. Though lab work typically had a steady schedule, sometimes things were shaken. “My typical day was- I think I worked 7:30 to 4:30, but we rotated since we had live animals in the lab there always had to be somebody on call,” Roberts said. “It depends on the study, some of the research was done using microscopes, so I could spend a whole day working at a microscope,” Roberts said. “There were complicated dilution systems set up for working with smaller fish and sometimes frogs. Out of the many studies and research projects Roberts has worked on, one stands out amongst the rest. Past experience working in the field can provide assistance when teaching, according to Roberts. 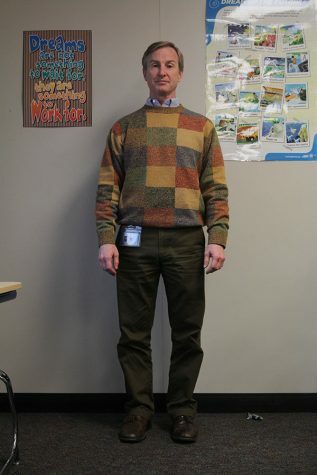 Previously working as an engineer at Honeywell, calculus teacher Brian Rodkey was able to take many of the principles from his past job and apply them to teaching math. Engineering has always been an interest of Rodkey’s, and he wanted to use it to make a difference in society. Rodkey said that when teaching, it is important to “understand something and communicate that,” in order to be successful. After working as an engineer for a while, Rodkey got to the point where he wanted to go into teaching, then he realized that was all he wanted to do. 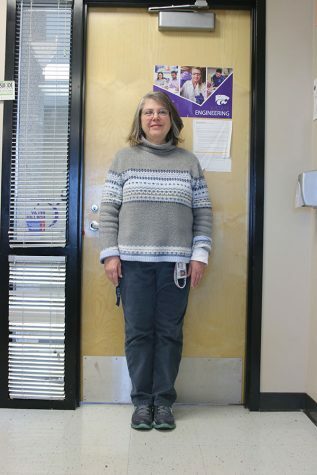 Extending her passion of biochemistry, chemistry teacher Mary Beth Mattingly was able to continue teaching what she loves. At the beginning of her teaching career, Mattingly got multiple jobs in the sought after university and hospital setting. “When we lived in Virginia, I worked at Virginia Commonwealth University in their biochemistry labs,” Mattingly said. “Then I worked for a while in the Chicago area at the Veterans Administration Hospital and worked in endocrinology, looking at parathyroid hormones and [preformed] some radioimmunoassays. Then I taught chemistry for a while back at my old college. While working at VCU, Mattingly mainly studied certain enzymes and how they would react when matched with a substrate. When it comes to transferring skills from one profession to another, there is one key skill Mattingly still uses while teaching.